Haydn Halvorsen races to first place at the CNISSF Nordic state championships on Friday, Feb. 16. Halvorsen, a junior at Sugar Bowl Academy, has won the past three state championships. 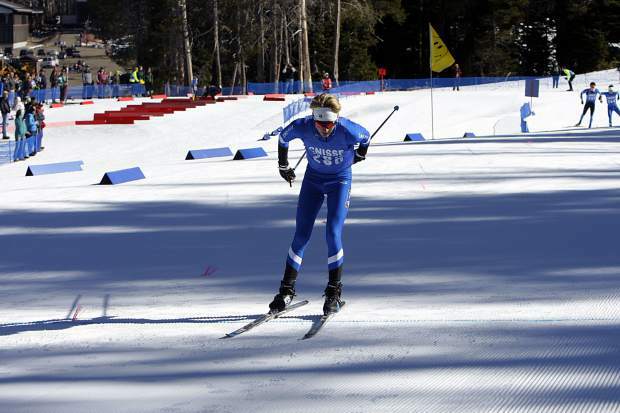 Sugar Bowl Academy skiers shined at the California Nevada Interscholastic Ski and Snowboard Federation (CNISSF) Nordic Championships on Friday, Feb. 16, at Auburn Ski Club. Junior Haydn Halvorsen skied to his third consecutive state championship, outpacing the field of 23 racers to finish the roughly 6-kilometer race with a time of 19 minutes, 26.00 seconds; while on the girls’ side Sugar Bowl junior Kianna Mullings won her first state championship, finishing with a time of 24:20.40. While the area has suffered through a dry winter, conditions were nearly perfect during a warm morning at Auburn Ski Club for the state championships. The skiers raced three laps on the course, and transitioned from classic technique to skate technique, something Halvorsen said was unusual for a state championship. North Tahoe’s JC Schoonmaker finished 21.60 seconds behind Halvorsen for second place. Sugar Bowl’s Nate Cutler was next with a time of 21:03.20, followed by North Tahoe skiers Nikolas Burkhart (21:19.20) and Cooper Anderson (21:21.60). Truckee’s Steffen Cuneo led the Wolverines with a time of 21:59.30 for a sixth-place finish. In girls’ racing, Mullings topped the regular season points champion, North Tahoe’s Lily Murnane, by 45.90 seconds. Mullings was also a second-place finisher at last year’s state championships. Mullings said she’d only skied in a race once before with a transition between classic and skate technique, and like Halvorsen, said pacing was key to capturing the state title. North Tahoe’s Kili Lehmkuhl was third with a time of 25:07.90, followed by teammate Camille Syben with a time of 25:37.80. Sugar Bowl’s Eleanore Hamilton rounded out the top five skiers with a time of 25:44.50. Abby Baier led Truckee with a time of 26:36.30 for a seventh-place finish.